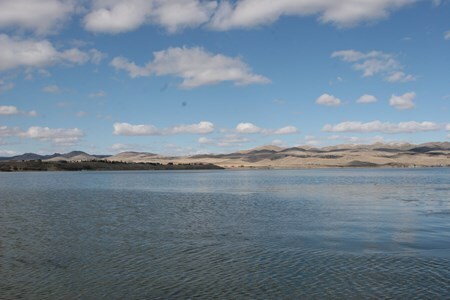 Ennis Lake is a medium sized reservoir that separates the Upper and Lower Madison Rivers. 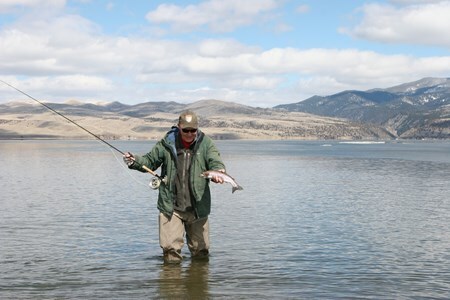 A day trip on Ennis Lake is a great option when planning a Montana fly fishing trip. 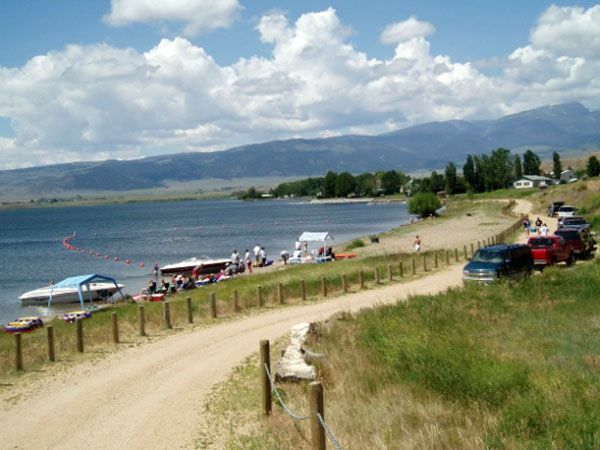 The lake is located just minutes from the town of Ennis and is also a short drive for anglers fishing around Bozeman. Ennis lake is a very shallow impoundment with most of the lake less than 8 feet deep. The inlet where the Channels of the Madison drain into the lake provide shallow flats with weedbeds that harbor outstanding trout habitat. 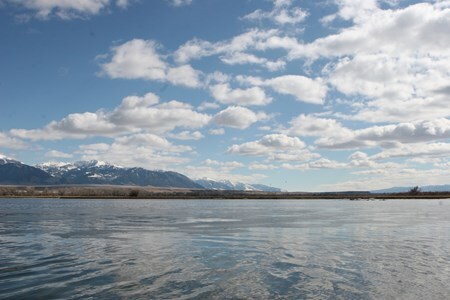 These shallow flats also allow for wade fishing. We use drift boats to access the upper half of the lake during prime hatches that take place on the lake in the late summer. The majority of the fishing on Ennis lake is sight fishing to large cruising browns and rainbows. We either fish directly from the drift boat or get out and wade on some of the flats. 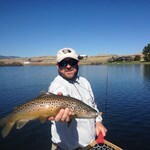 Occasionally we split a day with the morning spent casting to rising trout on Ennis lake and the afternoon spent fly fishing the Madison River. 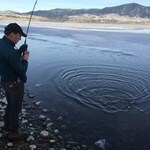 Fishing is good early in the season when the ice first melts but the fish are deeper and blind fishing around drops and structure is most productive. As the summer progresses callibaetis and tricorythode mayflies become the dominant food source for the trout. Intense hatches occur daily in the late summer producing a daily feeding frenzy that every fly fisherman should experience. Trout feeding during these famous hatches have been labeled "gulpers" after the frequent sucking noise they make as they swim around with open mouths while inhaling the hatching mayflies. 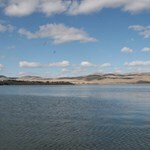 A full day trip on Ennis Lake near The Madison River and Ennis Montana. This trip meets in Ennis, Montana. 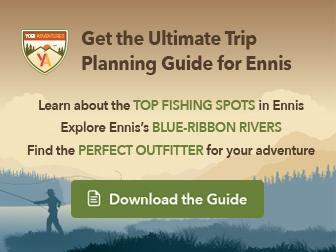 The guide will meet you in Ennis and provide transportation for the short ... more10 minute drive to Ennis Lake. At the boat ramp guides will provide instruction on the days fishing tecniques and launch a drift boat or motor boat on the lake. This trip is not ideal for first time anglers but can offer really fun casting to rising trout for those with some casting experience. The guide will provide all the flies and tackle that you need for the day. 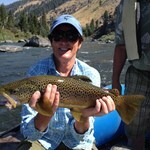 All you really need to bring is a Montana Fishing license, appropriate clothing and sunglasses for eye protection. 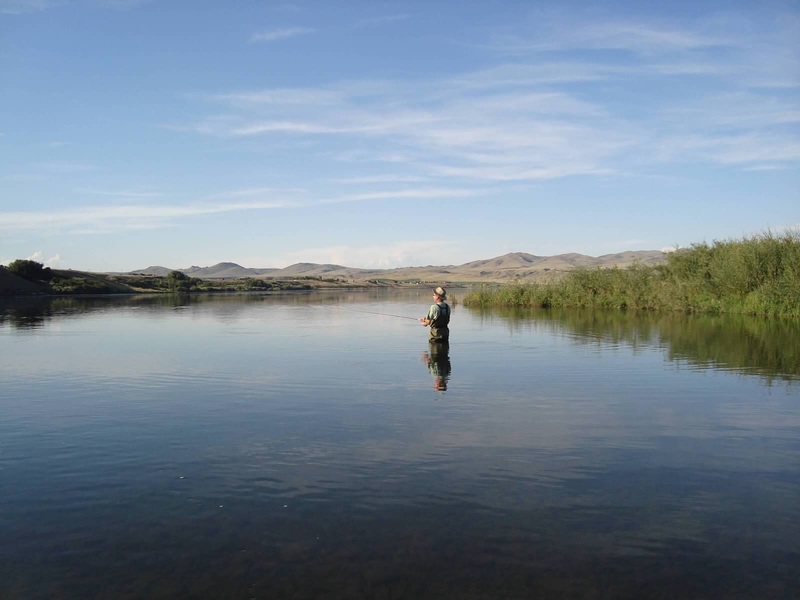 The fishing typically involves targeting rising rising trout with dry flies and dry droppers but fishing weed lines and flats with small lake streamers is effective as well. July and August are the prime months for targeting rising fish during big morning hatches. The fishing is usually done from the boat but wade fishing the flats is an effective technique as well. Wearing waders optional but recomended. At mid day you will take a break and enjoy lunch provided by your guide. The fishing on Ennis lake is typically stalking and delicatly casting flies to rainbow and brown trout. 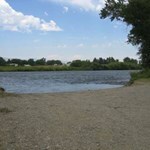 Ennis Lake typically will fish well from May through August. Late June through early August are considered the peak season. 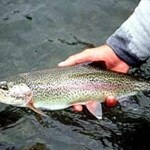 Trout typically range from 15-20 inches with fish over 20 inches possible. Fish in the 16-20 inch range are normal and the bigger fish of the day typically range from 19-21 inches. 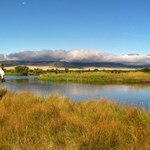 Ennis Lake is a great day trip to add some dry fly fishing to a Madison River or Ennis Montana fishing trip. With over 55 combined years of experience fishing Ennis Lake and Madison River, we have the deep knowledge needed to guide you to the monsters. 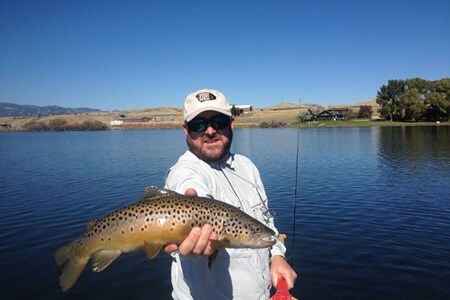 Located in Ennis, Montana, one of the ... moretop fly fishing towns in the world, Red Mountain Adventures is conveniently located to help you with your fishing experience. We'll take you to the land of giant trout that cruise Ennis Lake. Cast to rising trout or bring them in by stripping small lake buggers is a lot of fun. A day on Ennis lake is a special experience to enjoy the views and tangle with fincky monster trout. Ennis Lake full day float trip with lunch and flies provided. 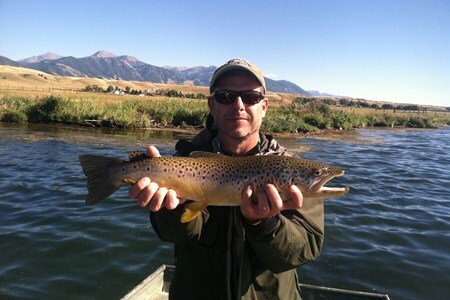 Enjoy a day on the water and reel in some fresh Montana trout. 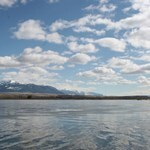 The Madison River flows into and out of Ennis Lake, and ... moreprovides the setting for your beautiful Montana day. A full day float trip on Ennis Lake is a great experience. 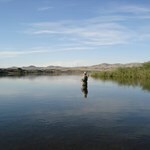 Ennis Lake offers very diverse opportunities for great trout fishing. Countless tactics and approaches work for wade and ... morefloat fishing Ennis Lake. Montana Fish Man can help unlock the Ennis Lake secrets and give you the angling tools for future success. 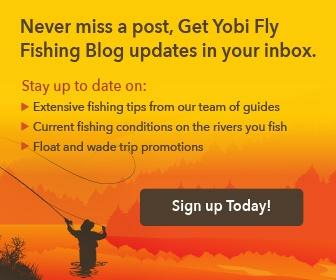 This is a great summer season option for beginners and expert anglers alike. 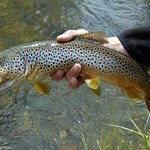 Fly fishing and light tackle spin fishing. For one or two people. Calibatis hatch still going strong and good pods of rising fish every morning. Weather has been pretty consistent. Ennis Lake usually stays glassed off until 2:00 or 3:00pm. There ... moreare usually bugs on the water until the wind comes up. If you still haven't had enough you can go out in the middle and free drift beggars in the wind. Lots of fish in the lake this year, but they are very hard to catch. You have to go down to 5x and the timing has to be perfect. You have to put it down soft and right on the money. Madison river fishing Co. has some very realistic calibatis patterns which seem to help. But overall it is not a game for children. Great eye candy though. Ennis lake is starting to warm up and so have the fish. Fish have been starting about noon then it slows down late afternoon. Not a lot of bugs on top yet, but you can catch them on ... morenymphs. Recent warm weather has started a bit of runoff. Lake is still crystal clear. That doesn't mean some color is going to kill fishing. Sometimes they like a little color. Calibates hatch still going strong on ennis lake. Good numbers of fish still working on the surface , but are getting smarter. Last week a size 16 pheasant tail couldn't miss. Now ... morenot so much. Actually did better on a size 18 blond parachute Adams. On the surface. Seems like less people lately. Thoughts are turning to shotguns and bows. The hatch usually starts around 9:00 or 9:30. Bugs peak around. 12:00. Then the wind usually comes up by 2:00 and shuts the whole thing down. Upcoming cold weather could Change thing s mayflies don't like cold weather. We will see. The lake has quieted down with the recent cold front. The mayflys didn't like the cold weather. You can still find some fish out on the flats bobber fishing with nymphs. I think we ... moreneed a couple warm days to crank the food chain back up. Warmer days are in our near future should get food again. Fishing was a bit on the “crisp” side with temps hovering around 30 degrees but the fish didn’t seem to mind. Once the ice melted off enough to get to the river mouths, ... morethe fish were happy to see us. We fished small black buggers down deep on a super slow swing and saw good action on both browns and rainbows. Outside air was cold and frozen guides were a problem but water temps stayed warm enough to keep the fish active. 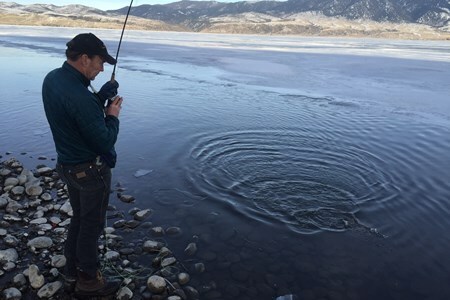 When faced with the frozen guide problem the best solution is to hold the rod down in the warmer water, which usually clears the guides in a few seconds. We started late in the day due to the cold conditions and ice on the lake. March fishing most often starts late. Sleep in, big breakfast, then hit the water around 12 or 1 when the water warms up. Good news, we saw the first Blue Winged Olive ( mayfly ) of the year. This means the big show is just around the corner. We found two selective fish on the surface sucking down dries. Dry fly season is just around the corner. Weeee! The warm winds are a coming, ice is melting back, time to let the mind wander from knee deep powder to knee deep water. A long piece of water has opened up, on the west side of Ennis ... morelake. Some fresh water seeps coming up are keeping the ice at bay, and the food chain is slowly coming to life. Went down yesterday with Shawn and my wife and were pleasantly surprised. We were casting a small grizzly buggar out on the ice twitching it off, letting it fall to the bottom then stripping it in super slow. Water is cold in both the lake and river; fish aren’t in the mood to do anything fast. Patience is the key. Let them take a good long look at I it. Shawn and Anni each had a couple of fish before I “got with the program” Once I got the right combination fly and technique I caught up in a hurry, One beautiful 21 in rainbow. It's game on out there. Ice is coming off everywhere and the fishermen are emerging from their winter slumber. 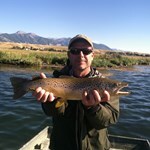 On the way to Bozeman saw 4 or 5 drift boats on the lower Madison one boat had a fish on. The 2016 fishing season has begun. 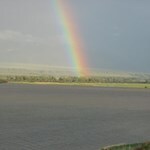 Heading up river tomorrow to see if the fish are awake, higher up. Tight lines everyone! 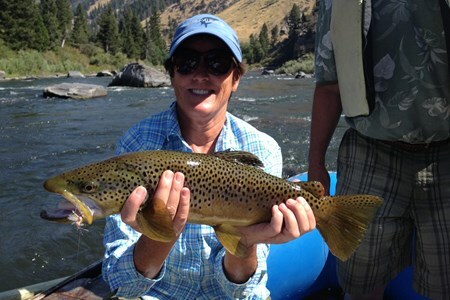 Experience the Madison River Like Never Before Learn the best spots on the Madison River with 3 great fishing days with Red Mountain Adventures. 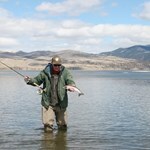 Eric Shores, with over 35 years of ... moreexperiencing guiding on the Madison River will take you down a journey of the best places to fish. 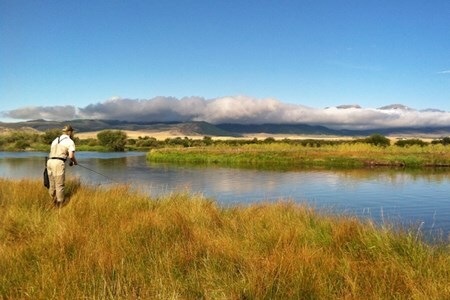 The journey starts on the Upper Madison River on a guided float trip covering about 8-11 miles of premier fly fishing water. The following day includes a recipe (location flies, and technique) on a do it yourself wade location near the fly fishing town of Ennis. The third day moves you on to where the Madison River dumps into Ennis Lake for a full float day stalking the giants. Note: The order or location may change based on where the best spots are at the time. 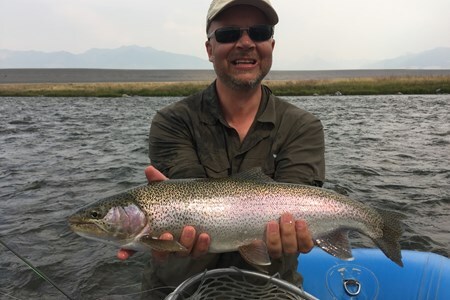 Experience the Madison River Like Never Before Learn the best spots on the Madison River with 5 great fishing days with Red Mountain Adventures. Eric Shores, with over 35 years of ... moreexperiencing guiding on the Madison River will take you down a journey of the best places to fish. The journey starts on the Upper Madison River on a guided float trip covering about 8-11 miles of premier fly fishing water. The following day includes a recipe (location flies, and technique) on a do it yourself wade location near the fly fishing town of Ennis. The third day moves you on to where the Madison River dumps into Ennis Lake for a full float day stalking the giants. The following day provides instructions again for a do it yourself wade day. 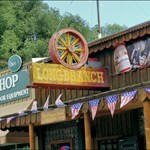 Location will depend on the hot locations during your visit. 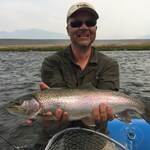 The final day is another full day float day on the lower Madison River. 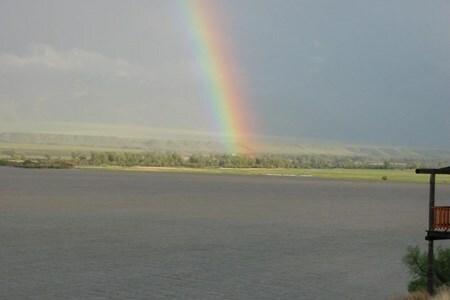 All together, you will experience the Madison River like never before by true expert.